I love light and fluffy gnocchi but all too often my attempts at making them at home have resulted in slightly heavier than desired (read: little leaden lumps..) and not the ethereal, fluffy little pillows I know and love. 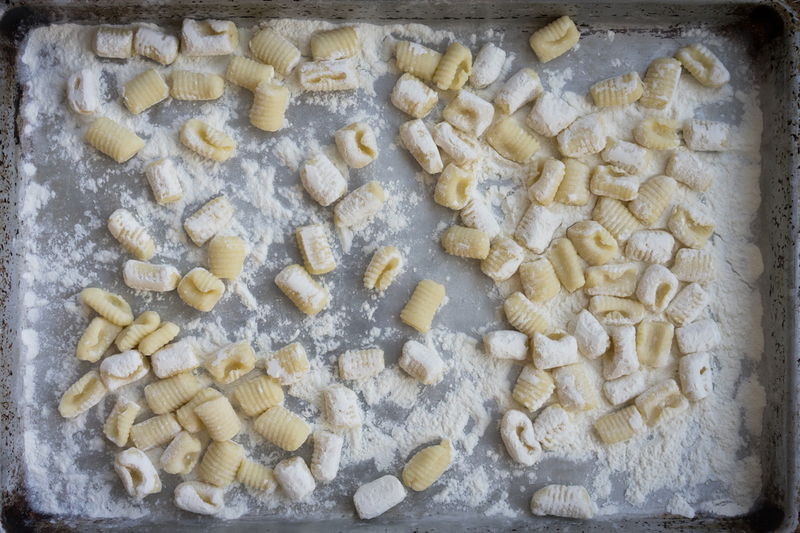 I really wanted to learn the technique for making a consistently delicious and light gnocchi so I headed over to Craftsy Cooking and purchased the online class: How to Make Gnocchi Like a Pro with Gerri Sarnataro. Wow, what an epiphany! I am blaming my potato masher for all my past frustrations. It turns out there are a few basic tips to making light and fluffy gnocchi- here they are in a nutshell. 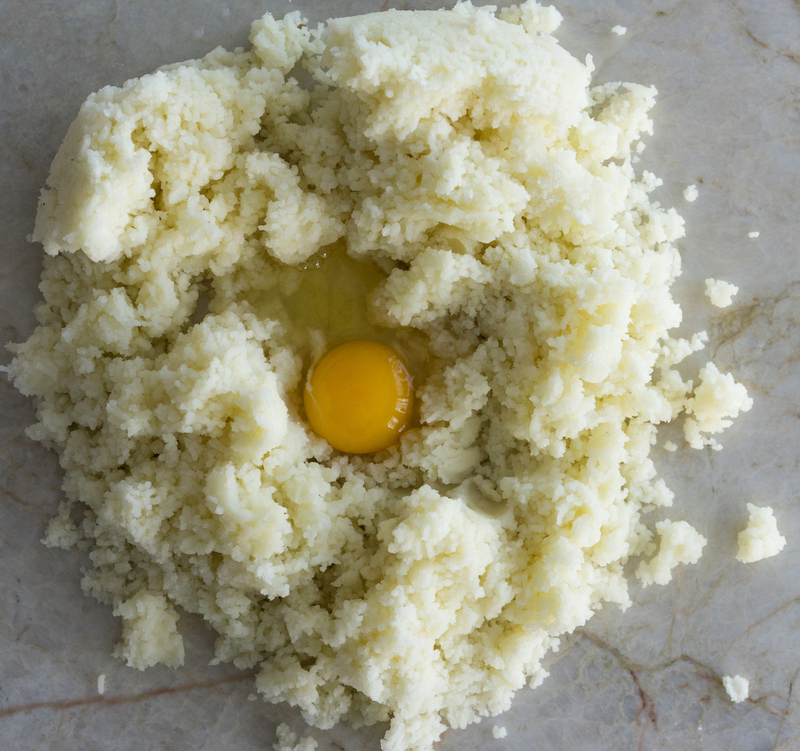 Use a bench scraper to “chop” the egg and then the flour into the potato to keep the dough shaggy and light. I seem to use less flour with this method as well. Don’t knead too much. Kneading should be more about pulling the dough together and smoothing it at the very end. Check out the recipe and video below for a bit more guidance. And by the way, the process is fairly quick and easy- except for the time it took to bake the potatoes, my gnocchi went from potato to plate in less than an hour. Thank you so much to Gerri Sarnataro’s awesome Craftsy class for really turning my gnocchi making skills around. The sauce I pulled together for this recipe is inspired by one of my favorite appetizers at one of my favorite restaurants here in Burlington, VT. Trattoria Delia is a fabulous, authentic Italian restaurant with amazing food and wine (with their own ethereal gnocchi incidentally) The appetizer in question involves smoked mozzarella wrapped in prosciutto and cooked in their wood fired oven so that the cheese oozes out when you cut into the crispy package. Even when it doesn’t appear on the menu, they always make it for me when I ask. And I always ask. In a large skillet, heat one tablespoon of the butter medium-high heat. Add the prosciutto slices and fry until they are browned and crisp on one side, turn the slices over and brown and crisp the other side. Remove to a plate and when cooled, cut into strips. Add the remaining butter to the pan, add the shallots and sauté until golden. Add the vodka and simmer until a bit reduced, then stir in the heavy cream and reduce a minute longer. Stir in the tomatoes and simmer for a few minutes until slightly reduced and a bit thickened. Season with pepper. (salt probably won’t be needed as the prosciutto is quite salty) Turn off the heat. Using a large slotted spoon, take the cooked gnocchi from the water and add to the sauce in the pan. 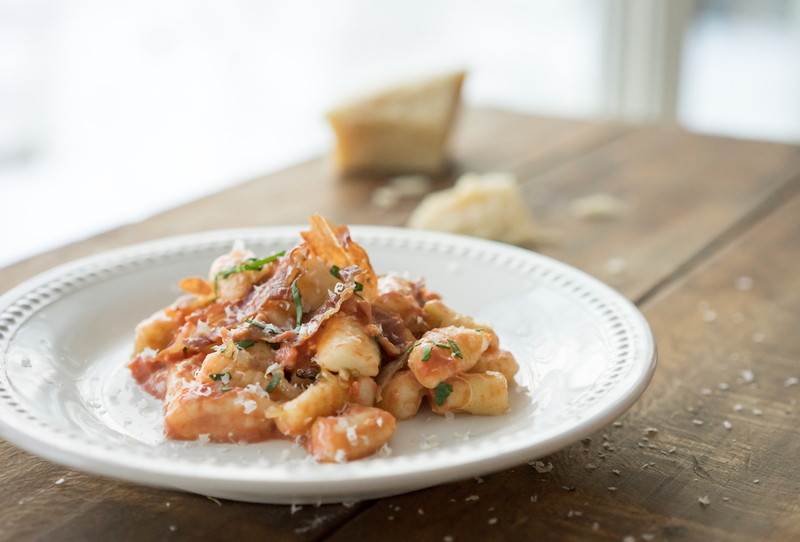 Here you may want to add a bit of the gnocchi cooking water to loosen up the sauce to the consistency you want. Sprinkle grated mozzarella on top and very gently fold into the gnocchi. The heat of the sauce with melt the cheese. 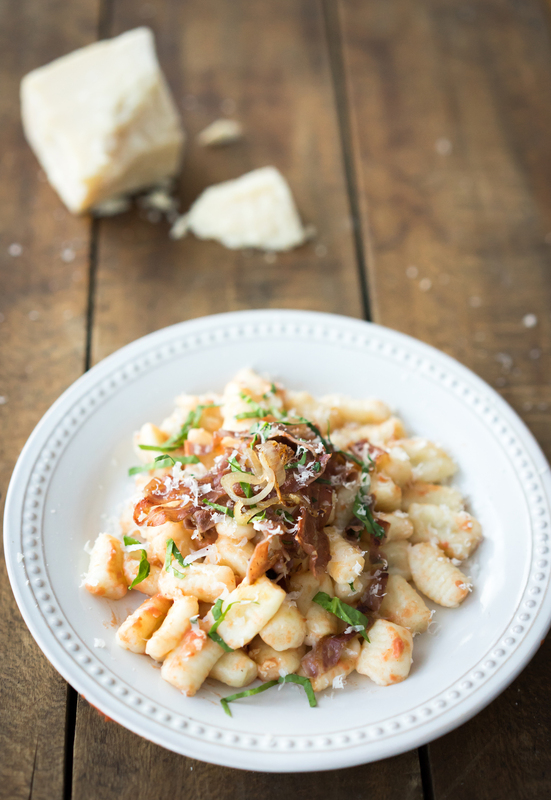 Plate the gnocchi and top with crispy slices of prosciutto, chopped basil and a grating of Parmesan. Scoop the potato into a ricer or food mill and process. (don’t use a food processor or the potatoes will become gummy) If you don’t have a ricer or food mill, press the potatoes through a large-holed sieve. 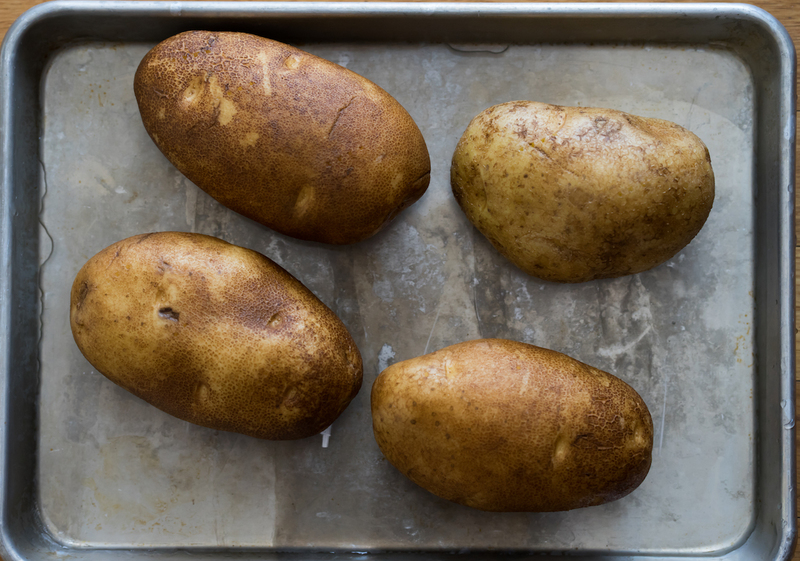 Dump the riced potato onto a clean countertop or board and make a small nest. Add an egg into the middle of the nest and using a bench scraper, begin chopping the egg into the potatoes until well mixed. Dump about a cup of the flour and the salt onto the potato and egg mixture, and using the bench scraper continue chopping the flour in, until it is incorporated and all comes together in a mass. Then begin kneading gently by hand until the dough forms a ball. If the ball is too sticky, add just a bit more flour to the surface and work in. 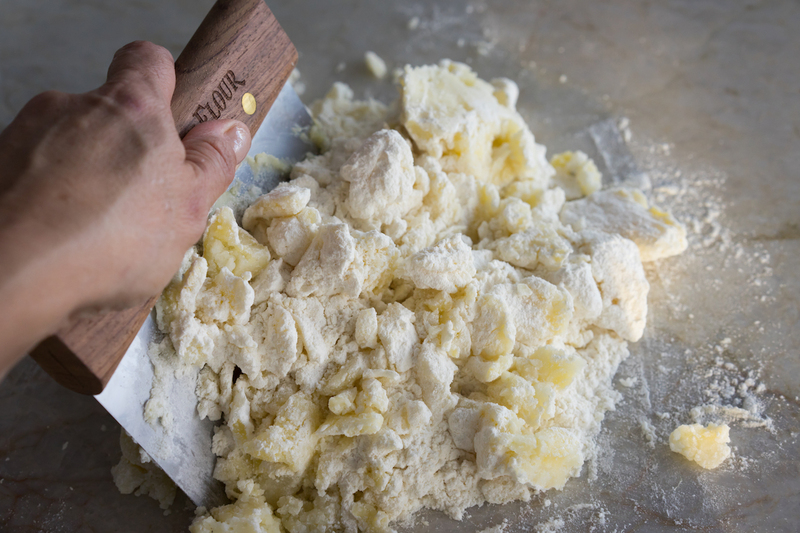 Don’t over knead though, you want fluffy gnocchi! Portion the dough into 6-8 pieces and roll each piece out into long ropes, about ½ - ¾ inch thick. Using the bench scrapper, cut into approximately ¾ inch pieces. 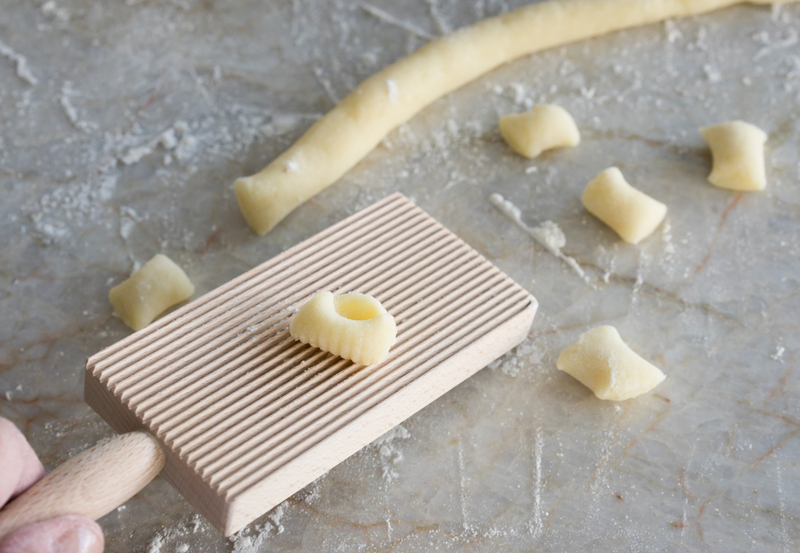 Using a gnocchi board or fork, roll the pieces (away from you) so that you have ridges on one side and a small indentation on the other side. Drop rolled gnocchi onto a well floured pan and store covered with plastic wrap in the fridge until ready to cook. Bring a big pot of well salted water to boiling. Add the gnocchi and allow water to come back to a boil. (don’t be temped to stir..) When the gnocchi rise to the top, allow to cook another 30 seconds longer, test one to make sure it’s cooked through, and then remove with a slotted spoon to the pan with the waiting sauce. 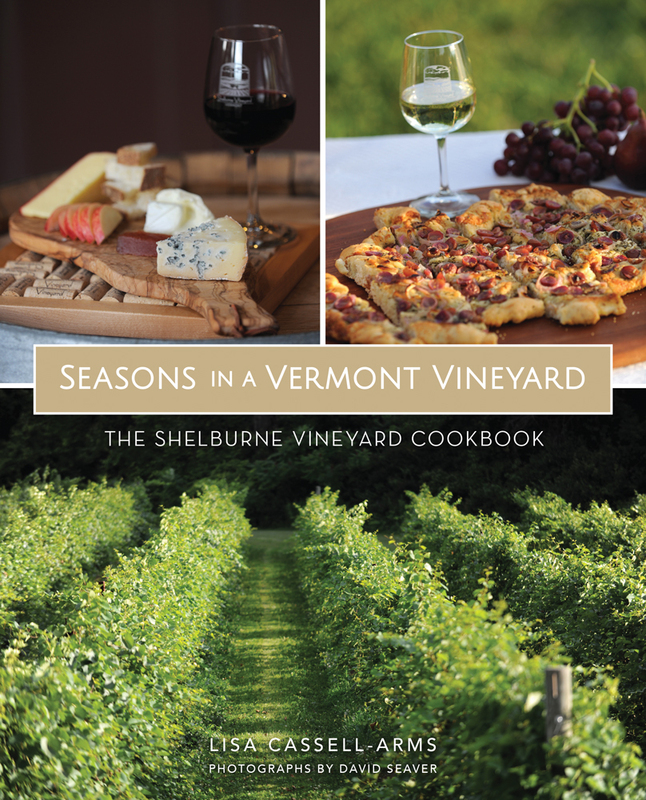 Cookbook – New edition available now!